Posted in Old Lady on July 3, 2008 at 11:19 pm. I’ve been cranking through the introductory bridge book I bought, implementing its guidelines for bidding in Old Lady. 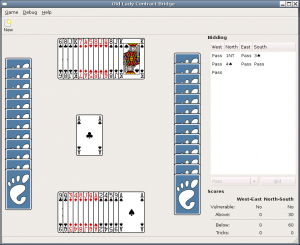 Thus far, the computer players can handle 1NT openings pretty much all the way through, and can respond once to any other 1-level opening bid before they find themselves in a situation they don’t know how to handle. 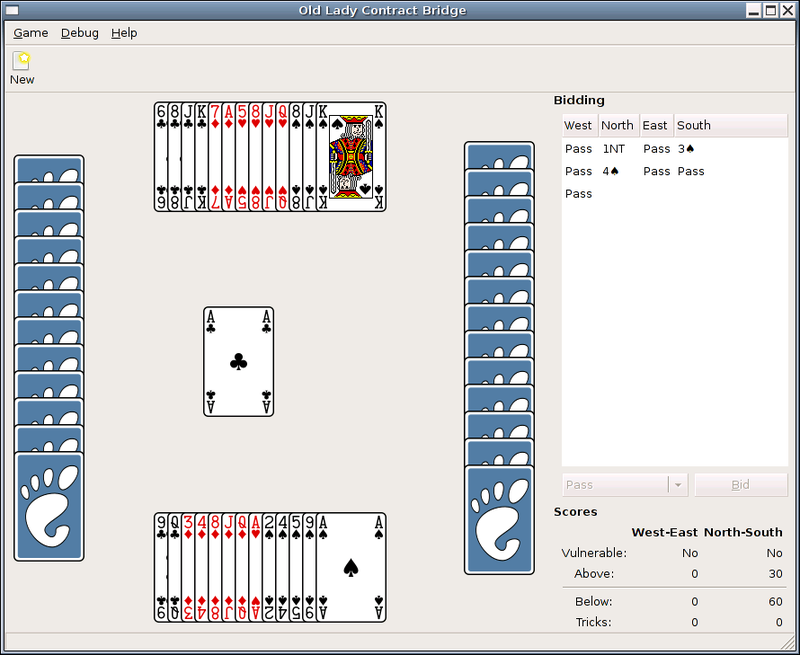 Here’s a screenshot of the most interesting 1NT bidding I was able to produce while playing it for a little while. North (computer partner) opened 1NT, since he had 15 points and balanced distribution. I (playing South) had 13 points and a long (5+ cards) spade suit, so I replied with 3♠. That reply is forcing to game, requiring North’s next bid to be at least at the game level. (His 1NT opening indicated 15-17 points, plus my 13 points meant we had 28-30 points total, and 26 points is the threshold for bidding game.) North could choose between game in spades or game in no trump, depending on whether our hands had enough spades between us. My 3♠ bid indicated I had at least 5 spades, plus his 3 spades gave us 8 total, which is enough for bidding in spades, so he chose 4♠ as our contract. For the record, we (meaning I, since North was dummy) did indeed collect our 10 tricks. The Prolog code that handles the computer players’ bidding works pretty well as far as it’s been implemented, though it runs noticeably slowly. The speed problems will be fixed later. I’ve implemented the bidding code as a state machine. The initial state is “opening”, and the bids made after that determine what the new state is. The state determines which set of rules to use when choosing (or interpreting the meaning of) the next bid. Specifically, the names of the states just happen to be the names of the rules that implement their initial logic, allowing me to use call/4 to jump into the right section of code. The bidding logic itself is spread across multiple SWI-Prolog modules that keep related states’ implementations together and hide the internal details. For example, one module handles opening bids; another handles bidding after a 1NT opening; a third handles responses to a 1-suit opening; etc. Key to the bidding code is the large set of unit tests for each module that make sure they’re doing the right thing. The vast majority of these are taken from the quizzes in the aforementioned bridge book. I figure if the self-tests are good enough for me, they’re good enough for Old Lady. Automated testing is essential for Old Lady; because of the randomness in each deal, you can’t just keep playing hands manually until the situation you want to test comes up, and then look to see if the computers behave correctly. For the adventurous, you can check the latest code out of the repository (bzr get http://www.kuliniewicz.org/oldlady/bzr/oldlady) and try it out. There’s still lots of bidding logic to implement, and the AI for the trick-taking portion of the game is still dumb as rocks, but it is at least playable. The configure script should actually make sure you have everything you need to run the program now. Any recommended strategies on learning Bridge besides writing an AI for it? I’ve been wanting to learn for about two years, but can’t find people that know how to play. I ask at parties only to get weird looks. It’s just not nearly as well known as Euchre in these parts. There’s an area on Yahoo Games where you can play bridge against other people if you have a (free) account, though I haven’t tried it myself. I haven’t found any really good sites on the web that explain bidding in detail. A lot of them just give you a list of rules to follow without any explanation for the rationale behind much of anything. I’ve found the book The ABCs of Bridge to be pretty decent, though, and that’s what I’m using as the basis of my AI.